Zbigniew Brzezinski’s The Grand Chessboard: American Primacy and Its Geostrategic Imperatives has long been the operative canon for State Department Hawks, Neoconservatives and Russophobes. Since the fall of the Soviet Union, the implementation of Zbig’s Grand strategy has moved at a feverish pace, gobbling up former Soviet satellites and then converting them into NATO forward bases. The endgame for the West, via these moves, has always been to quash Russian and ostensibly Chinese independence, economic viability and, thus, their ability to project power in Eurasia. 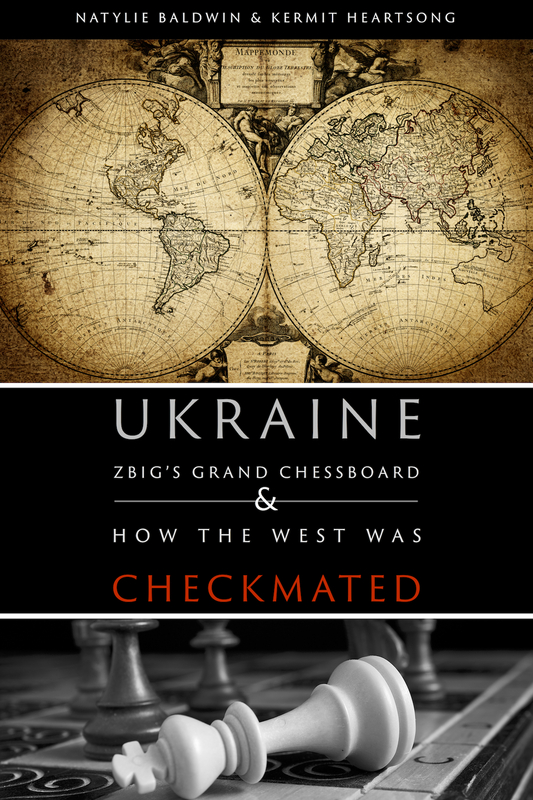 Ukraine: ZBIG’s Grand Chessboard & How the West Was Checkmated speaks to the historical and geostrategic moves by the West to control the Eurasian landmass: the broken promises and treaties, the geostrategic missteps and, finally, how Grand Chessboard fundamentalism actually catalyzed Russia’s re-emergence as a global power, shifted geostrategic power eastward and, proverbially, snatched defeat from the jaws of a U.S./NATO victory. Natylie Baldwin lives in the San Francisco Bay Area. Her fiction and nonfiction have appeared in various publications including Sun Monthly, Dissident Voice, Energy Bulletin, Newtopia Magazine, The Common Line, New York Journal of Books, OpEd News and The Lakeshore. She is a graduate of Cal State East Bay and also enjoys walking, hiking, the beach, movies, and classic television dramas. She is currently working on two novels. Kermit E. Heartsong a San Francisco native and author has written three non-fiction books —The United States of Mammon (2013), Illusions, Dystopia & Monsters (2013) and the Fourth Horseman (2014). Heartsong, an empirical scientist, has been a keen observer of the macroscopic developments of social, economic, and political systems for the past twenty-five years. He has been featured in Entrepreneur, Entrepreneur Young Millionaire, Success, Essence, and in author Carol Adrienne’s The Story of Your Life.